The Webb City Historical Society’s Mission Statement: “To collect, preserve and share the history of the Webb City area.” -Eileen Nichols. volunteer archivist, Jerry Pryor, at 417 673-1269. 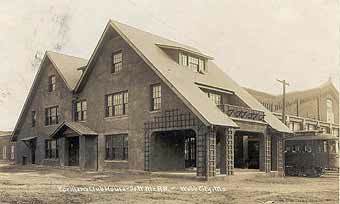 The Clubhouse was built in 1910 by the Southwest Missouri Electric Railway Company Employees Association. The Clubhouse was used for passing the time between shifts. It was equipped with showers, beds, card and pool tables. When the streetcar system closed, the building was donated to the county for use as a health department. In the 1990’s the county moved the health department to Carthage and the building was given to the Historical Society which undertook a major renovation effort, In 2010, the grounds were landscaped, funded by a grant from the W.H. and Marion Perry Foundation. There are several displays on Webb City history at the Clubhouse on such topics as: local minerals, mining, Lakeside, the history of the building, Sentinel newspaper photos from the last decade, and a display of cartoons by Nick Frising. The historical society archives include some 3,000 items which are cataloged. Access to the displays or archives may be arranged by calling 417 673-5866.